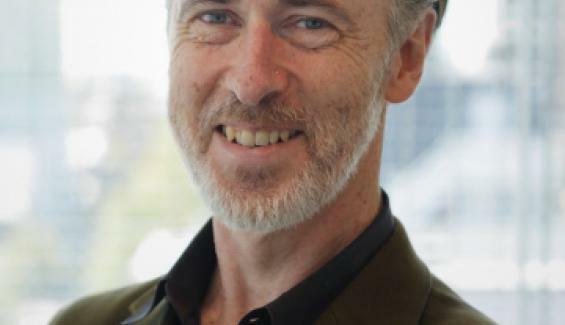 Conjoint Professor Seán O’Donoghue (BABS, UNSW), is a Lab Head at the Garvan Institute of Medical Research, and a Chief Research Scientist in CSIRO’s Data61. He has created numerous award-winning bioinformatics resources such as Reflect, Minardo, and Aquaria. He chairs VIZBI, an international conference series on data visualisation methods in the life sciences. His team’s resources are accessed by tens of thousands of scientists worldwide each year. Professor O’Donoghue’s contributions have been recognised with a C.J. Martin Fellowship from the NHMRC, an Achievement Award from Lion Bioscience AG, and by election as a Fellow of the Royal Society of Chemistry. He received his B.Sc. and PhD in biophysics from the University of Sydney. Much of his career was spent in Germany at the European Molecular Biology Laboratory (EMBL) and at Lion Bioscience AG. The rapid increase in volume and complexity of biological data requires urgent changes in how life scientists look at and think about data. There is a need to learn how to create high-data-density visualizations that clearly express the complex phenomena studied, that help uncover new insights, and enhance how scientists communicate. 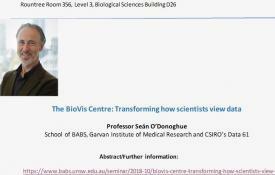 This is the mission of the newly launched BioVis Centre, led by Prof. O’Donoghue and located at UNSW’s Garvan Institute. 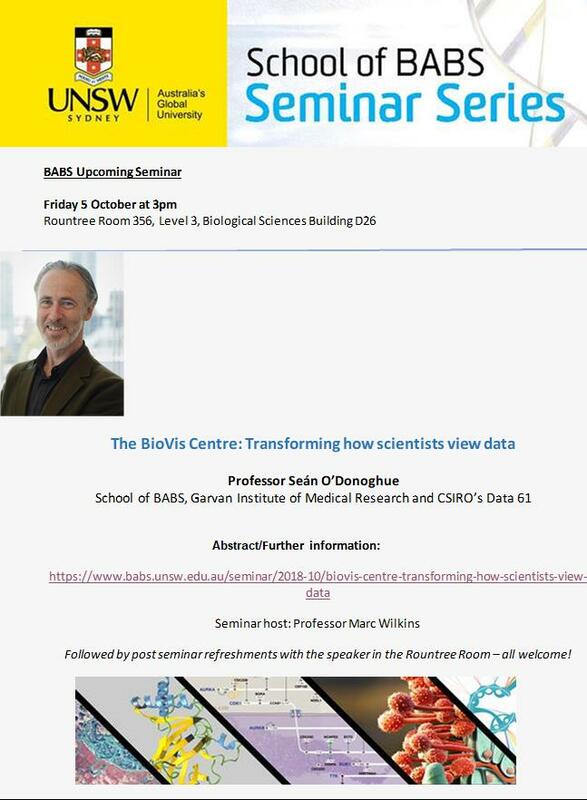 This seminar will illustrate how the Centre operates via showcases, created by the O’Donoghue team, built to facilitate interactive visual exploration of challenging datasets, including the protein ‘structural universe’, the ‘dark proteome’ of structural biology, phosphoproteomics, and three-dimensional genomics. Resources from the BioVis Centre are used by tens of thousands of researchers worldwide, have been published in top tier journals (e.g., Cell, PNAS, Nature Methods, and Lancet Oncology), and have been featured in Nature News. A review covering key points from the talk is at http://bit.ly/biovis_review, and further resources from the Centre are at http://vizbi.org/. Followed by post seminar refreshments with the speaker in the Rountree Room – all welcome!